In the world of interior design, Scandinavian is the hottest, most sought-after style right now. And for plenty of good reasons too. This white-wall-loving look is defined by its clean lines and simple shapes, but it also wholeheartedly welcomes the rustic appeal of natural materials and furniture oozing with warmth. Simplicity, elegance, and functionality – these are the key words that describe Scandinavian interior design. And if there’s one room where the principles of Scandinavian design are very appreciated, it certainly is the dining room. The dining room by definition, is a mix of living room and kitchen elements. You want it to be functional, but above all inviting – this is the main motivation behind Scandinavian style. A Scandinavian dining area combines natural, raw materials in modern, innovative ways. 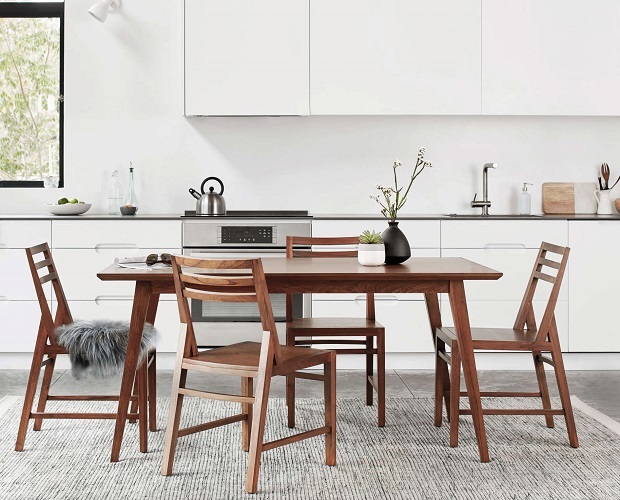 The furniture pieces all feature heavy use of richly toned hardwoods like oak or maple – from Scandinavian dining tables all the way to the floors and buffets. The dining area is a lovely, cosy space, where the family can enjoy delicious meals and where guests are more than welcomed. And the Scandinavian dining tables couldn’t express this in a better way. A long and chunky wooden table where ornaments are ignored or kept to the minimum in favour of pure functionality – the ideal setting for get-togethers. This table doesn’t even have to come with matching chairs. Its simplistic design can mix well with a variety of unconventional chairs such as Eams Rar, Wegner or Bentwood. Of course, simple doesn’t have to be boring. An odd geometric rug under the dining table and a vase with fresh flowers on top of it can infuse the Scandi-dining area some variety and life. You can also bring in some cute accessories, such as jars for spices, and floral or chequered tablecloths to carry a little bit of playful colour too. The white and neutral backdrop spiced up with small splashes of colour can make for quite a refreshing sight. Don’t forget to illuminate the dining table. Hanging lights can balance out the square design of Scandinavian dining tables. Whether it’s one large pendant light, or a group of several small lights that hang low, it will define your dining table setting. The lighting will visually separate the dining table from the rest of the room, creating an inviting focal point for everyone to gather round. Finally, Scandinavian style is the art of achieving as much as possible, with as little as possible. This means you need to put great effort in picking the right style of table and chairs – the essential furniture pieces for a dining room. From thereon it’s easy. Stick to a simple palette of mostly neutral colours with a few bold splashes in décor, infuse plenty of light – whether natural or with the help fixtures, and of course, fell free to add your own small personal touch.